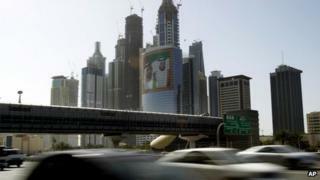 Eight online activists are reported to have been arrested in a continuing crackdown in the United Arab Emirates. The Emirates Centre for Human Rights said five people had been detained on Monday. at least one was held in Saudi Arabia and then handed over to the UAE. It came days after three others were arrested in connection with a Twitter account that is critical of the government, the UK-based group added. Last month, the UAE government tightened the law on internet use. It became a criminal offence to deride or damage the state or its institutions, or to organise unauthorised demonstrations. Human rights groups have said the legislation places severe restrictions on the rights to free expression and free association and assembly. The first three online activists were arrested last week, according to the Emirates Centre for Human Rights. The authorities were said to be looking for a critic of the government who appears to have received leaked documents from the interior ministry. The activist has a Twitter account, @weldbudhabi, with more than 11,000 followers. "He is the most wanted cyber activist in the UAE," a human rights campaigner told the BBC. "I told him it would be wise to stay quiet." The activist's Twitter account was reportedly hacked by the authorities on Friday - the day Saeed Majed Alshaer al-Shamsi was arrested. The authorities apparently believed Mr Shamshi was behind @weldbudhabi. But the real owner of the account subsequently used Twitter to say they had detained the wrong person. The two others arrested were believed to have messaged the Twitter account on the Thursday and Friday. The activist behind @weldbudhabi had been identifying plainclothes officers who work for the interior ministry's security agency. "He's really been getting under their skin, really annoying them," the human rights campaigner told the BBC. On Tuesday, activists reported that an Emirati who had been on religious pilgrimage in Saudi Arabia had been detained on Monday night and turned over to the UAE authorities. Like the others arrested he was said to have expressed his support on Twitter for jailed activists. These latest arrests follow the detention of the 18-year-old blogger, Mohammed Salem al-Zumer, earlier this month. Mr Zumer is the son of a poet and the nephew of Khaled al-Sheiba al-Nuami, who was detained earlier this year along with more than 60 other civil society activists, some with ties to Islah - a local group that advocates greater adherence to Islamic precepts. According to the Emirates Centre for Human Rights, five of those arrested in the past week are thought to belong to Salafist groups not linked to Islah, while the other three have been described as "having no links whatsoever with Islah".